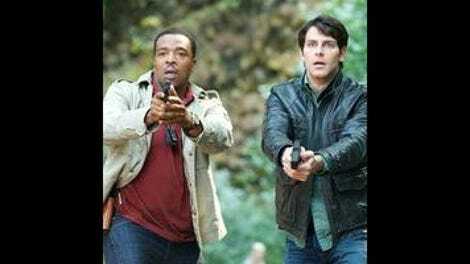 With Kevin off on an international crusade to uncover the secrets of the Seven Houses, I’ll be taking the Grimm reins for the last two episodes before the midseason break. Like Kevin, I’ve found this second season to be a mostly up and down affair, where the early hints of a more serialized narrative are continually glossed over in favor of the cases of the week. There’s been plenty of incremental steps in fleshing out all of the main characters, but it still feels as if the writers haven’t figured out how to connect those narratives together, and consequently it’s Nick and Hank’s investigations getting the lion’s (or Löwen’s) share of the attention. Plots involving Juliette, Renard and even Monroe are almost entirely separate from the main action, and save the occasional European scene the show hasn’t shown much interest in expanding its wider mythology. “To Protect And Serve Man” doesn’t do much to break this trend—with the exception of one promising development I’ll get to later—but as a case of the week it’s above duller installments like “The Bottle Imp” and “The Other Side.” This is largely because it’s tied so closely to the smartest move Grimm made all season, the decision to bring Hank into the fold and let him in on Nick’s secret life. Hank’s new perspective leads him to reconsider a case from seven years earlier, where an Army veteran named Craig Ferrin shot two brothers and claimed they were “monsters” who wanted to eat him. At the time, Hank was willing to write this off as an insanity plea, but now that he’s seen more than a few “monsters” of is own, he’s thinking that the case deserves another look. And a fast one too, as Ferrin’s on death row with just over 36 hours to go before his investigation. While it’s always a relief to see Grimm moving away from its increasingly stale opening strategy of “Nick gets a case, Nick sees Wesen, case gets complicated,” this approach is doubly intriguing because it gives Hank some momentum beyond merely adding a “Hank asks Nick if he sees a Wesen” step. Yes, Hank doesn’t want an innocent man’s blood on his hands, but he also remembers all too clearly when he saw something he couldn’t explain, and it led to him sitting in the dark tightly gripping a shotgun. 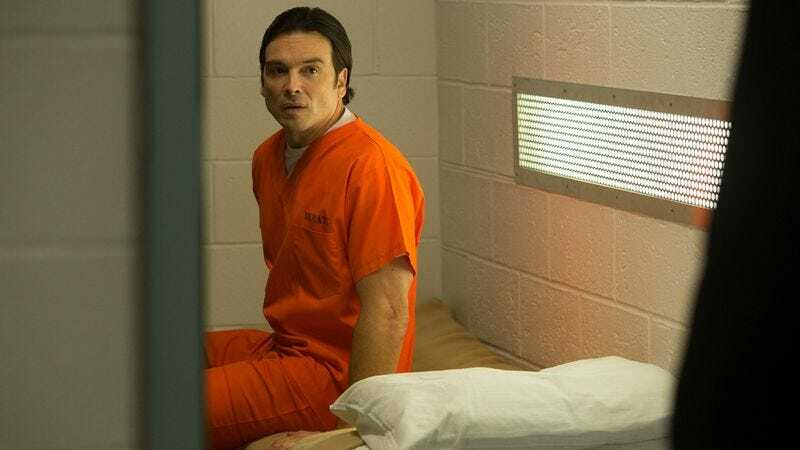 As he interrogates Ferrin (a sadly underused Jason Gedrick of Luck) about his experience, and the latter tries to hold it together remembering the fangs and claws, there’s a sense that Hank knows where the other man’s coming from, and an added conviction that Russell Hornsby carries well. From an emotional standpoint it’s compelling, but oddly what’s even more interesting is the procedural aspect of it. The question of how Nick balances his responsibilities as a police officer with the burdens of being a Grimm has grown increasingly sharp in recent weeks, particularly in his borderline vigilantism in “The Hour of Death,” and here the two worlds are outright slamming against each other. Nick and Hank are able to identify Ferrin’s attacker, matching his description of the “monsters” to a cannibalistic Wesen known as a Wendigo, but knowing and proving are two different things. No one, from the investigating officer to the district attorney, wants them to dig into what looks like open-and-shut case, and Nick and Hank know perfectly well the Magic Winnebago’s library won’t hold up in court. It’s interesting to watch the two try to find the bureaucratic loopholes they can use to keep investigating and sustain the evidence—a trope as old as the police drama itself, and one that the context makes even more interesting because the two are working against not just red tape but the accepted laws of reason. Placing the two outside the system also builds the suspense as they track the surviving brother to his remote home, in a tense third act that offers Grimm at its most horrifying. Between Nick falling into a pit of body parts, Hank stalking through a shadowy orchard and Kreski leaping through windows, there was an isolated and claustrophobic feel to the confrontation. (Though none of those moments can eclipse the seemingly more banal shot of a foot in Kreski’s stew as the episode’s creepiest moment.) Even from an editing standpoint it felt tenser than usual: Grimm’s transitions can be laughable at times, but the cross-cutting between Kreski’s house, the district attorney’s office and Ferrin’s looming execution was well-constructed. And tellingly, it’s all structured to the point where it’s never a certainty if events will line up in time to save Ferrin’s life—until it finally happened at the eleventh hour, I was entirely convinced the show was committed enough to its darkness that his survival could go either way. On the other side of the plot, Renard and Juliette’s kiss hasn’t done either of them any favors—Renard’s turned to Scotch to get himself to sleep, while Juliette’s confiding to a friend that she has feelings for another man. This plot hasn’t been terribly engaging all season, either on the amnesia or the romance side of things, but there’s a definite sense this episode that now even the characters feels like it’s gone on long enough. Juliette’s asking more and more questions, and finally starts asking the right ones as she pushes Nick for the exact details of her pre-coma circumstances. Nick shies away from telling her the truth, offering a annoyingly half-hearted explanation of “If I told you it wouldn’t make any sense to you.” That makes some sense, but given how much Hank was improved by learning the Grimm secrets, keeping Juliette from learning them feels like nothing more than a contrived delay. But that’s only one avenue to get things moving forward, and the show thankfully takes another right away: Renard finally accepts Monroe’s offer for help, and persuades Juliette to accompany him to the spice shop. This is an intersection that we’ve seen coming ever since Renard and Monroe first met, and from the moment Renard makes the appointment, the anticipation over the moment carries through over half the episode. And the result is as much fun as you’d expect: Monroe walks in on Renard and Juliette at exactly the wrong moment, you get one of those priceless Silas Weir Mitchell reaction shots as he realizes the enormity of what he’s seeing, and a disbelieving utterance of “Oh boy” before the cut to black. This is something the show can’t take back, much as Juliette will likely beg Monroe to remain silent, and all I can hope is that the fall finale next week keeps it from being dragged out too long. Now that Monroe knows Juliette was with someone else—and knows that they’ve been enchanted into mutual obsession—it can’t be long before one or the other tells Nick, and can’t be long before Nick deduces he’s in a love triangle with his half-Hexenbiest boss. And when that point comes, it could well be the catalyst Grimm needs to put the pieces together. Real-life Wesen sighting alert: Jeffrey Dahmer clippings attached to the Wendigo entry. I have to assume we haven’t seen the last of the district attorney/mayoral candidate Lauren Castro (played by Lisa Vidal of The Event). She owes Hank and Nick a favor now, and they’re the sort of cops who will find a reason to cash it in. Wu, when faced with bodies buried under a supermarket: “Clean up on aisle four!” Ah, that’s our Wu.